Pimco CEO Mohamed El-Erian worries what happens when the Fed stops buying bonds and rates start to rise. The Federal Reserve's never-ending bond buying program is causing Pimco Chief Executive Mohamed El-Erian many sleepless nights. He's worried the Fed won't be able to end its bond buying without "collateral damage." "The Fed will exit under two conditions: either because they are successful or because they become ineffective," El-Erian said Monday, speaking on a panel at the Milken Institute Global Conference in Los Angeles. Pimco oversees $2 trillion of assets, including Pimco's Total Return Fund (PTTRX) -- the world's largest bond fund. El-Erian worries about waking up to find the Fed has been ultimately ineffective at generating economic growth and jobs. He was one of a number of executives who are concerned about the unintended consequences of increasingly aggressive central banks around the globe. "I started trading at 21 years old," said Terry Duffy, the executive chairman of CME Group (CME). "You always have to have a vision of how to get out of a trade before you get in. The Fed needs to do that before they get in any deeper." The Fed currently buys roughly $85 billion a month in Treasuries and mortgage-backed securities as part of an open-ended program started last September. "Right now we are seeing distortions in markets," said El-Erian. "Resources are being misallocated. There are already concerns about bubbles. That's what gets broken in this journey." 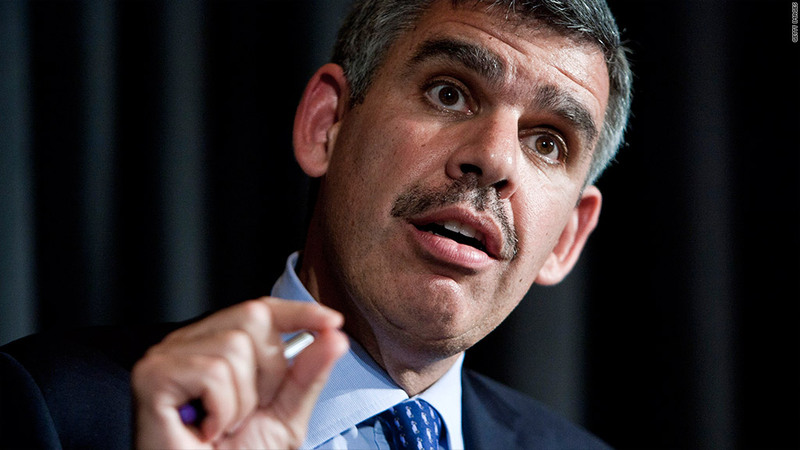 El-Erian noted that there's a major disconnect between the health of the economy (and job growth) and the health of the financial markets. While the Fed has been successfully kept interest rates low, what happens when those rates begin to rise? If growth comes back, El-Erian says, rising rates are less of a concern. What's more worrisome is if growth doesn't come back fast enough. El-Erian puts the odds of the Fed's actions working at 50/50. Related: Gross: What if the good times end? This disconnect is even more stark in Europe. El-Erian spoke of the "incredible contrast" between how markets are valuing the debt of southern European countries and where unemployment stands. He specifically called out Spain, where the overall unemployment rate stands at 27%, and youth unemployment is a staggering 57%. Investors in Europe are still willing to ignore the dire employment situation and simply listen to a European Central Bank that's prepared to "do whatever it takes," said El-Arian, But that can't go on forever. "The central bank assisted road has got to give way," he said. The ECB is widely expected to cut rates this week for the first time in 10 months.